Both Grognardia and Stefan Poag recently mentioned WGR1 Greyhawk Ruins. Apparently this is one of those megadungeon publications that I had never heard of, and does not seem to be very highly thought of by Greyhawk fans (or some Grognardia commenters: exhibit 1, exhibit 2). The Amazon reviews, however, are uniformly positive (even the two star review criticizes it as “a location not an adventure,” which sounds like a compliment to me). The image can be found in this free gallery (cached here since it is freely available), and seems to be from some Third Edition take on Castle Greyhawk. I kind of just want to take that elevation and draw my own maps for it. This entry was posted in Spotlight on March 21, 2012 by Necropraxis. I’m trying to find a (reasonably priced) copy of that set. I think it looks good. I don’t really care if it’s not the “real” Castle Greyhawk. It’s a big dungeon and it looks interesting . . . Does anyone have an opinion of that 3.5 book? I haven’t seen it myself, but I would also be curious if anyone else recommends it. My knowledge of the edition 3 years is quite limited. I wouldn’t recommend it. It isn’t really a mega-dungeon. 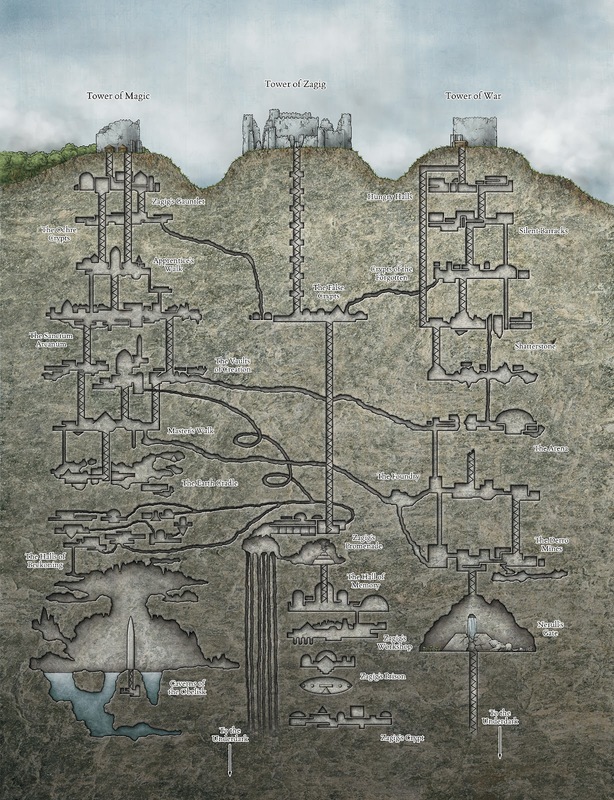 It only describes a few of the levels (those on which “the story” takes place) and although the PCs are allowed to wander somewhat on those levels, it’s really a big railroad. If old school play is what you’re looking for, it’s probably even worse than the 2nd edition version. There’s lots to like there – some of those carved-out places look a lot like Islamic tomb-complexes to me, and then the lab’s deliciously science fantasy, unlike the rest. I’m intrigued. it’s a cool cross-section, although the level “themes” seem much less gonzo than what we know about Gary/Rob’s versions. At the bottom, though…why did every damned 3rd ed. 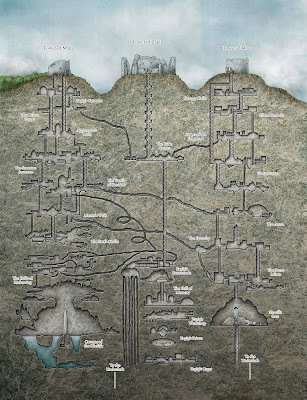 map have to have the words “to the underdark”? Was it by law? Seriously, I’ve been glancing through a big stack of 3/3.5 era Dungeon mags recently, and it just makes my eyes glaze over every time I see it. Yeah, “workmanlike” seems to be the general consensus on both of those products. 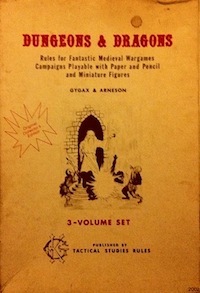 As you might imagine, the former was not well received by Gygax himself, perhaps especially because some of the contributors had explored the real place or were in contact with those who had.